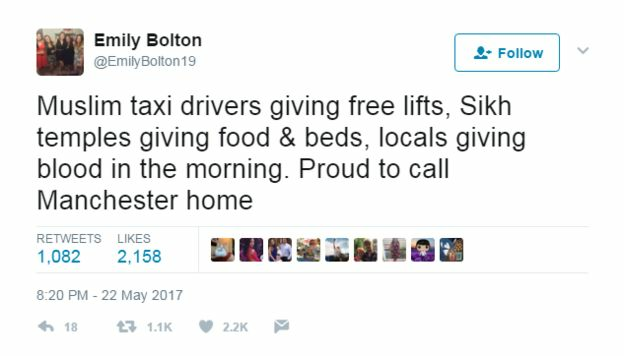 Stories of acts of kindness are emerging in the wake of the Manchester attack, with many people from the community rushing to help – offering free lifts home and rooms for the night. 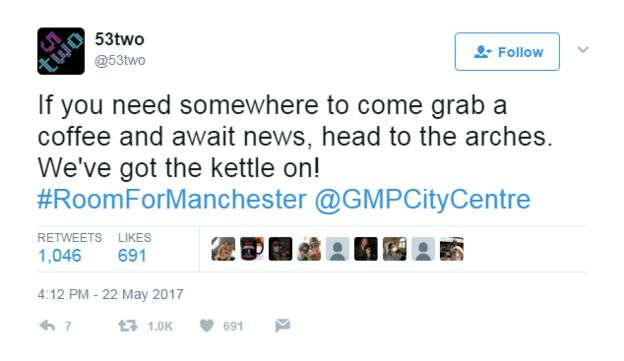 As hundreds of people fled Manchester Arena following the explosion, taxi drivers began taking people to safety. Driver AJ Singh said he tried to help wherever he could. “I’ve had people who needed to find loved ones. I’ve dropped them off to the hospital. They’ve not had any money, they’ve been stranded,” he told Channel 4 News. 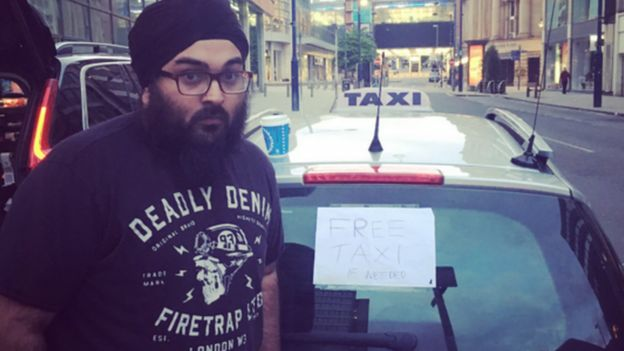 Sam Arshad, from StreetCars Manchester asked his drivers to give free rides to anyone stranded after the Ariana Grande concert. “The audience was a very young audience, and there were a lot of people there without their parents,” he told the BBC. “And it’s then that people were requesting taxis but they didn’t have money. Colin Paterson, the BBC’s entertainment correspondent, was standing outside as the audience were running out of the arena. “As I was standing there a taxi just pulled over a said ‘would you like a lift? I’ll take you anywhere’,” he said. “There are stories of cab drivers driving over from Liverpool to try and offer people free lifts back to Liverpool. Liverpool City Region Metro Mayor Steve Rotheram, whose two daughters and two nieces were at the concert, praised the “spontaneous acts of ordinary people” of Manchester following last night’s attack at a concert in the city. “The spirit that they have displayed is just typical of people in this part of the world,” he said. “A taxi driver from Kirkby fought his way through horrendous traffic and got out of his cab to find my daughters and two nieces. I am forever grateful to that person. 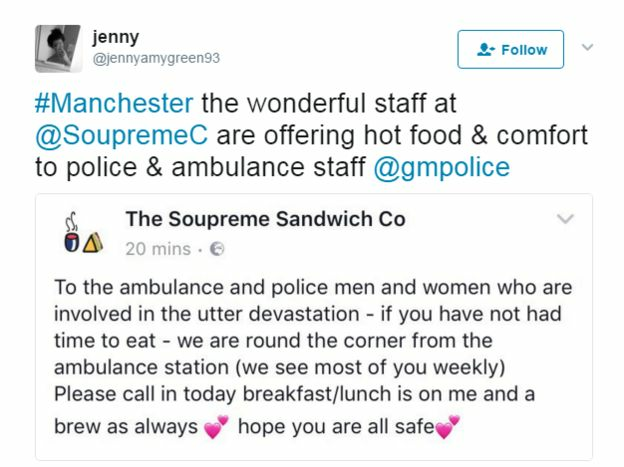 Praise for these acts of kindness poured in on social media, along with offers of help. 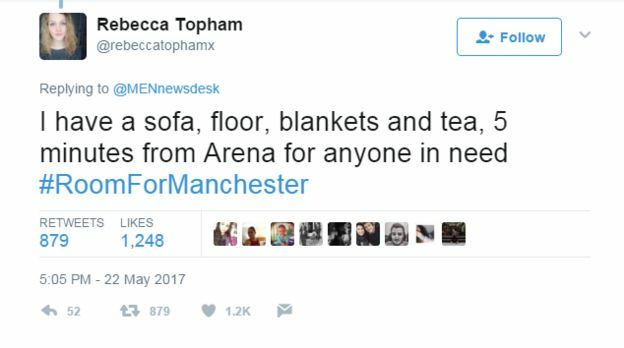 As news of the attack spread, locals soon began offering spare rooms on social media, under the hashtag #RoomforManchester. Thousands of people have also turned to social media to find missing relatives and friends – and there are many people who are offering support. Olivia Campbell Hardy has been missing since last night’s concert. Her mother, Charlotte Campbell, speaking on Radio 4’s Today programme said “she’s not been found yet” but “she can’t thank people enough” for having helped her since her appeal on social media. 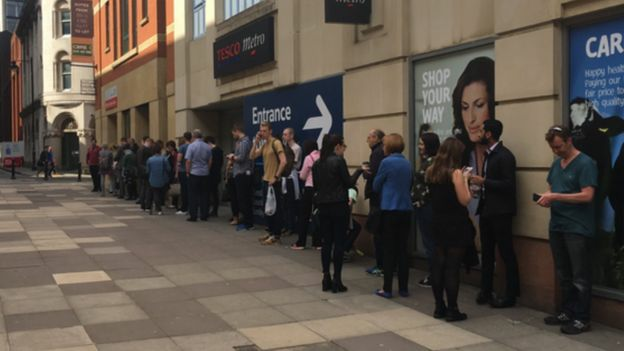 Elsewhere, there are reports of cafes offering free drinks for the emergency services, people bringing tea to the police at the cordon and others queuing up to give blood. 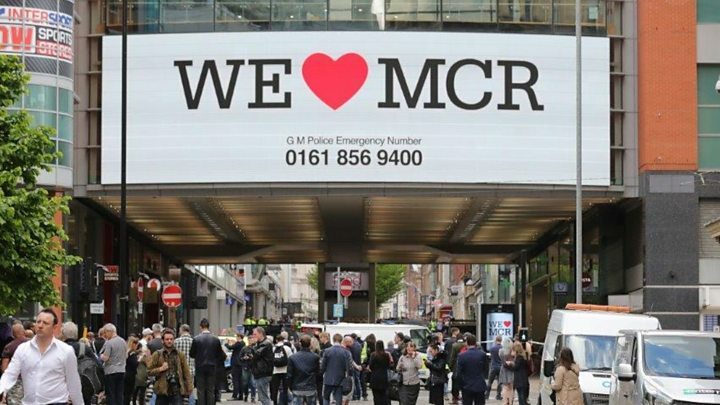 Meanwhile, more than £50,000 has been raised for a fund to help support the families in the aftermath of the attack, set up only hours ago by the Manchester Evening News. Mr Burnham praised the efforts of the community, saying that their efforts demonstrated “the true spirit of our city in the face of such devastating tragedy”. “They responded in the best possible way with generosity, with kindness, that was I think humbling,” he said. “And I think that sends a message to the whole world about what kind of people we are here.